It was now a full week since we'd arrived in Switzerland, and that week had been really, really jam-packed with some great drives. We were starting to run out of time, though, and we had promised ourselves at least one "outdoorsy" outing during our trip. And Luke had expressed some interest in a Via Ferrata - a very particular kind of fixed climbing route where you climb along a pre-set protective wire. 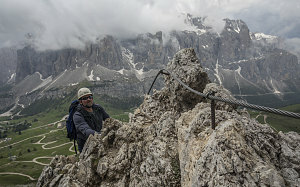 As avid readers of my website will know, the best place in the world for Via Ferrata routes is in the Italian Dolomites. Which weren't all that far away from us. And which also has many excellent twisty highway routes that we hadn't yet driven. 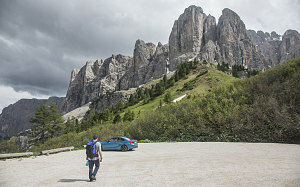 So, the plan was this: drive to the high Dolomites; find an alpine rifugio; climb an easy via ferrata route; Stay overnight; explore and enjoy any good twisties roads along the way; return the next day. 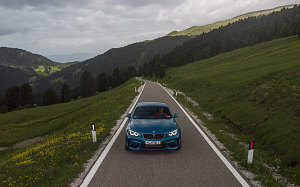 In order to make decent time and allow for more exploration of the Dolomites, we (for once) avoided the twisties possibly way and instead took to the main highways, passing through Austria and over the Brenner Pass into Italy. 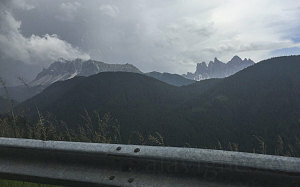 Only when we neared the high Dolomites did we exit the Autostrada and start to hit the twisty stuff. 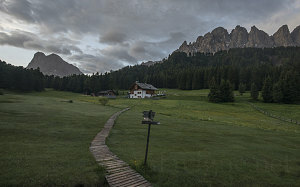 As a small aside, let me describe the Dolomites (and dolomite itself): named after a 17th-century french geologist, the Dolomites are a range of exceptionally jagged peaks, rising often near vertically out of more gentle, hilly terrain. The rock itself is a metamorphosed form of limestone known as (you guessed it) dolomite, and it's very pale, and often appearing whitish. It solid, craggy stuff - great for climbing and prone to forming fantastical-looking landscapes. 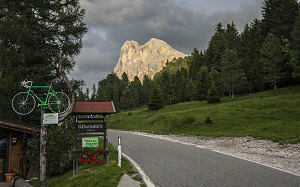 An intensely engaging Strada Provinciale 29 brought us up from the town of Brixen and into the Eores valley, a high valley right on the northwestern fringes of the high Dolomites. 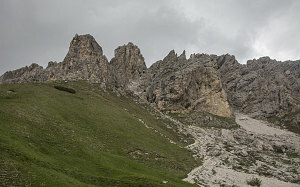 The nearest of the dolomitic crags -- known as "Tullen" -- was now just across the valley from us. Unfortunately we couldn't see it all that clearly because a short but intense rain shower blocked most of the views right at that moment. 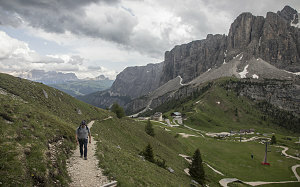 Within twenty minutes, it had passed it had become sunny again, but by that time we had passed the good viewpoints and were back in the forest again, climbing up towards a height of land known as the Passo delle Erbe. The highway up towards this pass was pretty small and narrow - and on my map I could see a number of potential huts and rifugios. 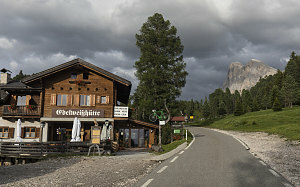 We presently came to one - a tidy germanic looking thing right on the side of the road, called the "Edelweisshutte". I had not called in advance, since I had by now gathered that early June was essentially pre-season. I confidently entered and asked for a room for Luke and I and... indeed, there was no one booked at all for the night and we were once again the only guests (at least for now, I suppose). We had arrived mid-afternoon, and had successfully secured our room. The question was now... should we do our via ferrata with the time we had remaining in the day, or did we wait until the next morning.... Doing the former meant we'd be a bit rushed today, but would improve tomorrow's time packaging. And indeed we needed to be mindful of time, for the day after we needed to be headed off north to the Nurburgring at the crack of dawn. Andrew checks the map as we cross into Italy. We'll head to the rifugio and see if they have space first. Bonus, they have room. Place is beautiful and again, not just a flophouse. Dinner set for 6:30 pm and the kitchen already smells amazing. 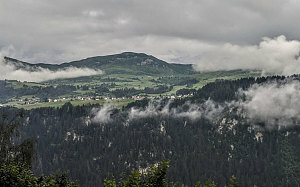 Off to climb a ferrata first, though the weather looks dodgy. Andrew is becoming more concerned (as I would be) about the tik tik tik sounds coming from the wheel assembly areas under cornering load. Internet chat suggests it might be normal brake/hub movement, or perhaps steering rack or spindle nuts. Other people seem to have experienced it. Some say it's just normal operation (we doubt) others saying it's something that needs tightening. We may try to make a dealership run for a basic check. It will be Andrew's call obviously, but I've told him not to worry about keeping me happy with doing stuff. If he wants to get it looked at, then I'll help make it happen however I can. We will try and get a recording of the sound too to play for the dealer. Maximum efficiency won out over laziness, and we decided to do our ferrata climb today. With not many hours left before the hut's designated dinner time, we needed to rush rush rush and head out right away. 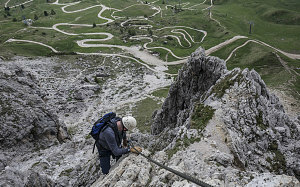 I cast about in my mind for a nearby short ferrata, and arrived on a Grade 2 ferrata just above the Passo Gardena, which was about an hours' worth of (twisty) road driving away from us. A fun but somewhat congested drive saw us descending and re-ascending, routing around the series of peaks that stood between the rifugio and the start of our climb. 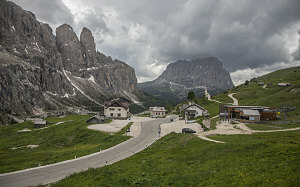 First east over the Passo delle Erbe, very narrowly paved, then down into the Val Badia to one of the main highways in the area, which we took down to Corvara / Colfosco, a larger twin-town in the northeastern Dolomites. 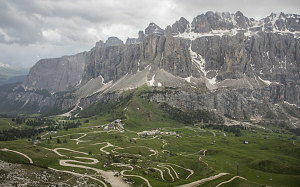 We turned back east, climbing up wide and well-paved switchbacks (but lots of traffic) to a parking lot near the Passo Gardena (Gardena Pass). It was brilliantly sunny at this point, and with the white rock of the cliffs and the gravelled parking lot (also composed of white dolomite rock), it was nearly blinding without sunglasses. 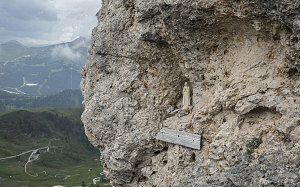 Let's stop for a moment to examine some of the views from here and to characterize what makes the Dolomites so distinctive: the formations are bold and sharp - often with vertical or nearly vertical cliffs; the rock (dolomite - a metamorphosed form of limestone) is pale, nearly colorless, and strongly reflects light, often at times appearing white. 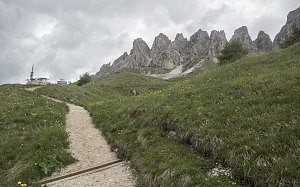 Scree slopes are minimal, and alpine meadows often directly abut the pale cliffs, creating a strong contrast. The general look, therefore, is this: jagged spires or walls of white rock, rising up nearly directly out of green rolling meadows. There's no where else that looks quite like it. Now then, on to the climb. 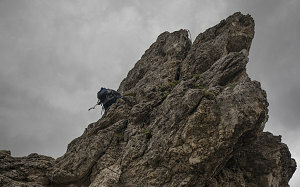 I had selected a climb up a small but impressive tower of rock called the Tschierspitze V (or Piz da Cir V in Italian). It was at the end of a long, tooth-like line of jagged peaks that formed the northern side of the pass. The total distance from here to the base of the tower was not far - perhaps more than a kilometre but less than a mile. Luke and I gathered what we needed - climbing harness, a ferrata belay system, helmets, a bit of water, and some wind and rain clothing. We began our walk shortly after 3:30pm, following an obvious path that led up and across wintertime ski runs, the lines of lifts running over our heads. The bright sun at the parking lot had given way to gloomy couds that raced across the sky. It was a continuation of the weather pattern we had seen all day: brilliant sun interrupted by roving pockets of cloud and rain. 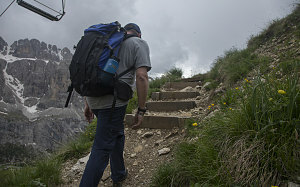 Hopefully we could time our climb to avoid a direct hit by a rainstorm. It took us about fifty minutes to climb up to the base of the Tschierspitze V tower. The clouds and the potential rain had threatened us, but had so far stayed at bay. 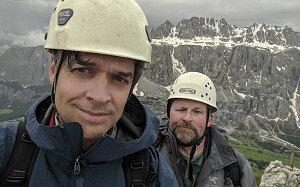 We stopped to don our harnesses and I gave Luke a quick refresher in the ways of via ferrata climbing. Time to get climbing: the weather wasn't waiting, and our hot delicious rifugio dinner wouldn't either (if we were late). 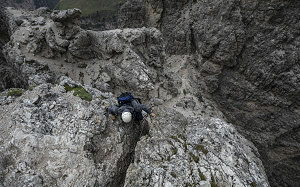 The Tschierspitze V ferrata is graded as a "2" on the most popular difficulty scale used. Generally that means that while there can be significant exposure and verticality, the climbing is straightforward and not too strenuous. And that was indeed the case: superb holds everywhere, with no spots where a reassuring grip wasn't immediately apparent upon inspection of your next move. And there were several exciting little sections of airy exposure. Luke's initial apprehensions quickly melted away and he was clearly enjoying himself. Just plain fun! The machinations of the weather continued on as we climbed. And wouldn't you know it - about halfway up - we heard the distinctive rumble of thunder. It soon repeated again, this time closer, booming and echoing off the walls of the massive Sella Group just opposite us. 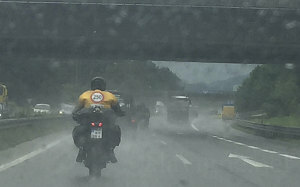 A bit of pelting rain started to fall, too. So... being fastened to a long metal wire that runs down from a mountaintop to its base is... well, let's just say, not in general the best idea in a lightning storm. 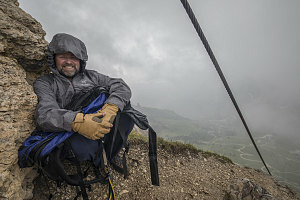 So, at the next little safe spot - a small platform, we disconnected from the wire, huddled down with our rain gear on, and waited it out. A few more booms of thunder and a few distant flashes of light, and the storm seemed to pass us by. It never really rained all that heavily either. When the sounds of thunder had receded enough, we clipped back in and continued on. We weren't far from the top at this point, but time was ticking by, and I was a bit worried we'd miss the 7pm rifugio dinner. 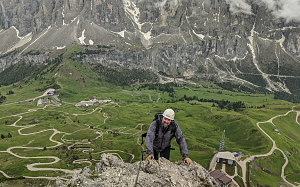 The ferrata climb was short - less than one hour in total including the forced stop due to the thunderstorm. 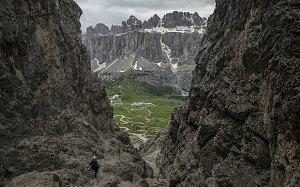 There was an amazing view from the airy, small tip of the tower, across the pass to the snow-streaked walls of the Sella Group, tendrils of the recently departed storm still clinging to nooks and crannies in the rock. Some high-fives and few selfies and it was time to head down. Fortunately there was only a short bit of actual down-climbing needed, before an alternative descent route, consisting mostly of light scrambling and hiking, led us down a steep gully adjacent to the tower (this is often the case with ferratas, where there is a climbing route up and an alternative, often non-technical descent route). Although we tried to rush, it was still already 6:30pm by the time we arrived back down to the parking lot at Passo Gardena. There was no way we were going to make the 7pm dinner time at the hut. I was worried they'd just close up the kitchen for the night - especially since we were the only guests there. 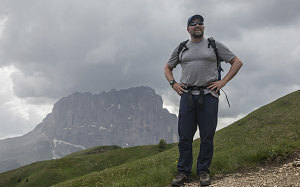 Fortunately there was good cell service here at Passo Gardena, so I phone over to the hut and beseeched Daniel (the hut's friendly custodian) to perhaps wait just a wee bit longer for us to arrive. 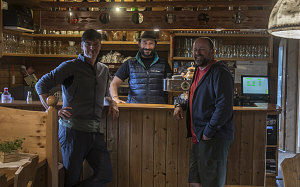 He was instantly accommodating and (again as a result of us being the only guests at the rifugio) more than happy to slide dinner forward until we made it back. 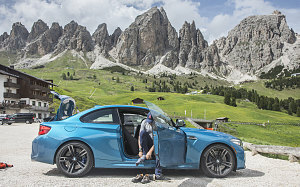 Our tardiness nevertheless gave a little extra imperative to our drive back - which, over the many excellent twisties between the Gardena and the Rifugio, the M2 handled with aplomb. we arrived back shortly before 7pm. Daniel the caretaker was sitting on the outside deck, smoking and chatting with the hut's cook, and in general emanating a relaxed, unhurried air. He cheerfully waved us in and said to come down for dinner when we were ready. 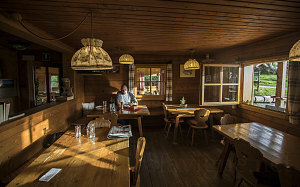 The slanting rays of the late-day sun warmly lit the all-wood finishings of the rifugio's dining room. 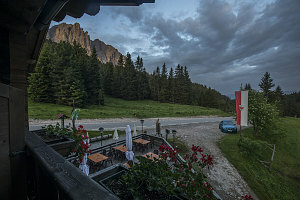 Once again we were the sole occupants of the rifugio tonight, so we had some extra latitude over the menu. We ended up on a stew/ragout as our first dish, done in a style which Daniel and the cook said was typical of this particular region. Combined with a refreshing radler, it was the start of another excellent multi-course meal (I will re-iterate - you eat pretty well when you stay at these hut/rifugios). 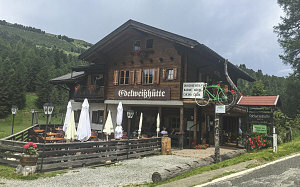 After dinner, the cook left for the day, and Daniel motored off in his VW Golf, presumably to fetch something from town. So, for the rest of the evening, the rifugio was completely empty save for us. We wandered around on the peaceful grounds, sitting on a swing set for a bit, watching the interplay of clouds and slanting sunlight, which at times generated some dramatic scenes. Luke was impressed with how easily and comfortably one could travel through these mountains, staying at incredible little picture-perfect places such as this. 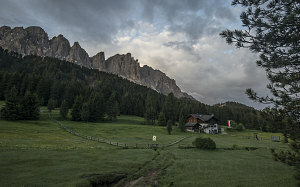 After a very quiet, dark, peaceful night at the Edelweiss hutte, I awoke very early - around 5 a.m. - to get outside in the solitude and quiet for some dramatic mountain aerial shots of the dolomites. Luke slumbered peacefully inside while I captured some nice views of the sun against the ridge of Tullen and of the conifer-and-meadows patchwork below. 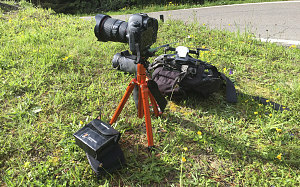 Later, after Luke had risen and we'd finished breakfast (and paid up and said goodbye to Daniel), we headed up to the nearby Passo dell' Erbe for some final attempts at some hairpin cornering action and various other types of video flybys. I was getting a bit better at things, but clearly still had much to learn. What will you put me through today? 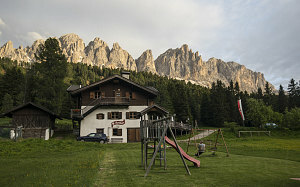 Although we would have loved to hang around the Dolomites for longer, it was time to head back to the Swiss flat. 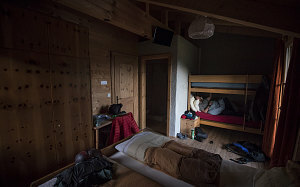 The next morning we had to pack up and head north for the next exciting chapter of our trip - the Nurburgring! Along the way back to the flat, I stopped off at the BMW dealership again in Chur to have them look at a strange metallic ticking sound from both front wheels that only occurred when cornering hard (and irrespective of braking or accelerating). Most of all I wanted to ensure that there were no safety concerns. 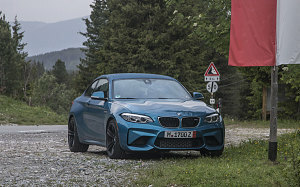 Turns out that ticking and other noises from BMW M Motorsport brakes (such as those on the M2) are not uncommon. 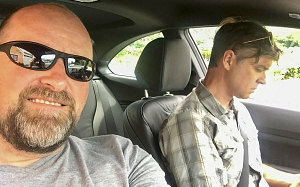 During a couple of (low-speed) roundabout rotations on the test drive with the service tech to demonstrate the issue, I got noticed by a couple of Swiss undercover police officers, who raced into the dealership parking lot and confronted us with a barrage of angry German questions. Fortunately, the service tech was fluent in the local dialect and managed to diffuse the situation. Yikes. Back at the flat, we made our final dinner and packed and cleaned up before heading to bed at a decent hour. Tomorrow would be a long drive north, back into Germany. 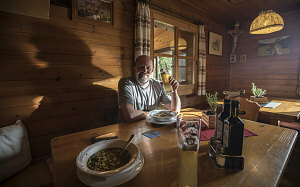 Awesome morning breakfast with our host Daniel (at the rifugio Edelweiss). Very nice fellow. Fun chat about running a rifugio plus kids and Tech. His daughter is 15. Get away from the screen and love the life out there he tries to tell her. A bit of slow twisties and drone work and then we had to hit the road and make tracks. Through the Brenner Pass again in the autostrada and autobahn through Austria. We need to get back to Chur to get the car looked at at 3 pm. 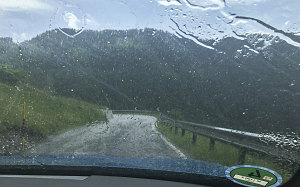 Rain in Austria - heaviest we've seen. These tires are excellent, and their new replacement - the Pilot Sport 4s are supposed to be even better in the wet! Made it back to Chur and the garage looked at the car. Ursula (nice mechanic who spoke English) checked the BMW database and found out this is a known thing with M cars. There's a fix. But not necessary until the car gets to Canada. So we are safe to take it on the track! Headed back to the flat where we discovered my phone has been using up tons of data whenever I connect to wifi. Andrew's annoyance of Apple comes through in the questions he asks me about my phone. I can tell he's ticked about the data usage, as he investigates and tracks down why we have used so much. I read my book the whole evening. Do some laundry. And hit the sack at 10 as we have to be up at 4:00 tomorrow. Orange is supposed to text him when his account is "approved" so we can buy more data. Oh and I left my brand new hiking shoes at the rifugio. F#$%.